My Symptom Checker is a Google Chrome browser extension that will change your browser’s settings if you allow it to enter your computer. 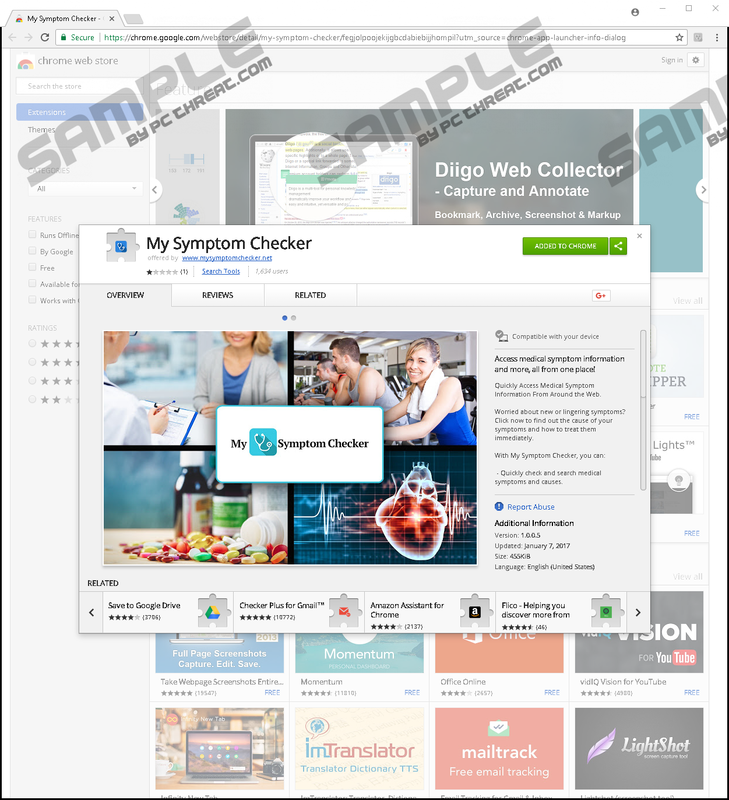 Some users download it voluntarily from its official website (http://www.mysymptomchecker.net/) or the Chrome Web Store (https://chrome.google.com/webstore/search/My%20Symptom%20Checker?hl=en-US) because it is presented as a beneficial application. Specifically speaking, it promises to enable users to access medical information, such as medical symptoms and causes, information about drugs and supplements, and health tips. It goes without saying that not all users install it willingly. To be frank, we are sure there are people who do not even know when and how My Symptom Checker has infiltrated their computers and affected their browsers because, as research conducted by researchers at pcthreat.com has shown, it might be spread bundled as well. No matter how this piece of software has entered your system, our piece of advice for you would be to remove it because it is nothing very beneficial and, on top of that, it acts as a potentially unwanted program. Of course, these programs are not harmful threats, but they might still act in an undesirable way, so if you asked us what you should do, our answer would be simple – remove My Symptom Checker. It is not a real threat, so its removal should be quick and easy, especially if you use the manual removal guide our specialists have prepared for less experienced users. Even though My Symptom Checker can be installed next to other programs without the users’ knowledge, unlike real malware, it does not try to hide on users’ computers. It changes Google Chrome settings right away. Consequently, users find their preferred homepages and New Tab URLs gone. It is all this browser extension does, so we cannot call it very beneficial. Yes, it sets a page that contains buttons opening third-party pages with medical symptoms, tips, information about medications, etc. ; however, this content can be accessed without its help too. What else our researchers have managed to find out is that the search tool the page set contains is untrustworthy. Speaking specifically, some of the search results it returns after users enter a search query in the search box are modified. They only drive traffic to specific third-party pages, so it is not very likely that you will find anything you are searching for quickly if you use it. Theoretically, these modified search results might even take users to untrustworthy pages, so our specialists do not recommend using search tools that cannot be fully trusted. Additionally, if you keep My Symptom Checker installed, you should know that it might record and store URLs that you visit and other information about your search activity. All details it records might be shared with third parties: “This information may be shared with third-party applications that use Search Data to function.” The gathered data will be used to provide “more customized information” and for various advertising purposes. My Symptom Checker has been categorized as a potentially unwanted program also because it might affect users’ Google Chrome browsers without their knowledge. According to our researchers, it is very likely that this browser extension travels in software bundles together with other applications. Potentially unwanted programs are not the only ones that are spread bundled. Other untrustworthy programs might show up on your system illegally too, so you cannot leave your system unprotected. We do not say that you have to know how to prevent all threats from slithering onto the computer; however, we highly recommend that you install a powerful security application on your computer to make sure malware cannot show up on your PC illegally one day. This tool must be enabled 24/7/365 if your PC is connected to the Internet and you surf the Internet every day. If My Symptom Checker has been installed on your PC without your knowledge and you do not like all these changes it has applied, go to remove it without further consideration. It is not one of those sophisticated malicious applications, so we are sure you will erase it quickly if you use our manual removal guide (you will find it right below this paragraph). As you can see, you just need to access the add-ons manager and delete the unwanted extension. Another way to get rid of this potentially unwanted program is to perform a scan with a reputable antimalware scanner. Select My Symptom Checker and click the recycle bin icon next to it. Quick & tested solution for My Symptom Checker removal.